Mar. 13, 2019: Sandwiched between Bronxville and Scarsdale—both ranking high on Forbes magazine’s list of the wealthiest zip codes in the country—Tuckahoe is a diamond in the rough. Like Bronxville, Tuckahoe is a village within the town of Eastchester; both occupy about one square mile and lie along the Harlem line of the Metro-North railroad. But Tuckahoe’s previous lack of development left the village out of the limelight. Now, opportunists are taking note. While Tuckahoe’s transformation began some 15 to 20 years ago, its growth in the past five years has been substantial. 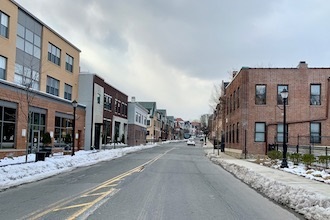 Several high-end apartment complexes have been built—most recently, 100 Main Street and The Quarry—and even studio apartments have been readily snatched. 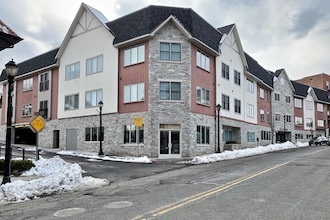 Tuckahoe Mayor Steve Ecklond reported that this housing expansion has been attracting downsizers from Bronxville and Eastchester, as well as those migrating from Brooklyn and Manhattan, whose customary reliance on public transportation makes downtown Tuckahoe an easy switch. 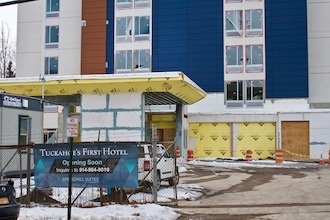 Slated to open this year is a Marriott SpringHill Suites, which will offer 153 guest rooms and amenities that include a small swimming pool, street-level parking, and a stand-alone restaurant. While the Marriott has been tight-lipped about the third-party operator of the restaurant, Mayor Ecklond reiterated the village’s ban on fast-food establishments. Adding to that, he urged the hotel’s development team to avoid pizza. “We have 11 pizzerias,” he noted. Marriott SpringHill Suites under construction. While the rate of business turnover in Tuckahoe appears unremarkable, the number of vacancies has been kept low. 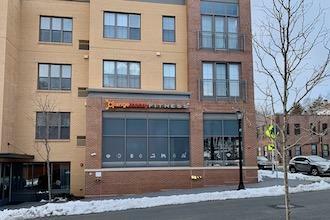 The current mix is reflective of both the village’s forward-looking development—such as the recent opening of Orange Theory Fitness—and the needs of its diverse population, including a bodega and a laundromat. Ecklond reported that a new high-end restaurant is heading to Main Street. The Generoso Pope Foundation, a private philanthropic foundation that funds education, health, cultural, human service, and civic organizations, also remains a prominent mainstay. Beyond commercial development, Tuckahoe has recently experienced a boost from the Eastchester-Tuckahoe Chamber of Commerce, whose new leadership—co-presidents Karina Wyllie of Koala Park Daycare and Juan Gonzalez of I Train With Juan—has infused a new vigor into the chamber’s activities with the creation of community events held in 2018 and a heightened presence on social media. 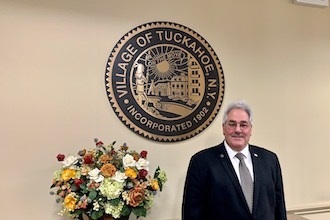 Ecklond, who recently announced his decision not to seek re-election after twelve years in office, admits to a bittersweet sentiment about stepping aside but feels upbeat about the state of Tuckahoe’s affairs. The Ecklond family roots run deep; his son is a fifth-generation Ecklond being raised in the same house. Upon running for office over a decade ago, Ecklond learned that his great-grandfather, Charles Ecklond, had also served as Tuckahoe mayor around the turn of the century. Whereas Charles Ecklond oversaw the electrification of Tuckahoe, Steve Ecklond oversaw the submergence of electrical wiring underground as part of the streetscape development plan. Pictured at top: Steve Ecklond, mayor of Tuckahoe.